Many people find it much less stressful (painful) being tattooed by someone they find pleasant to sit with, who’s company they enjoy, than by someone they don’t feel comfortable with. The consultation offers clients the opportunity to decide if they feel good about the artist over-all, confident in their integrity, ability, and mannerisms to a degree that inspires trust. professional: A face to face consultation offers the artist and client an opportunity to openly discuss the tattoo concept, share ideas, inspirational material, and ask one another relevant questions. Any good consultation will involve a sharing and exchange of ideas. The tattooer should offer ideas, suggestions, insight, and considerations based upon their experience and inspiration that may significantly influence the concept over all. Being open to the consideration of the artists ideas is crucial in getting the finest work the artist can produce. Ideally the consultation will take place at least a few days, if not months before the first tattoo appointment. A healthy length of time between consultation and tattoo offers collectors the opportunity to let the artists suggestions and considerations “sink in”. If the artist makes suggestions during the consultation that you’re not sure about, this time will allow you to consider it and make a decision based on careful consideration as opposed to being forced to make a decision on the spot. This discussion of the concept is the only way that an artist and the client can determine if they are a good “fit” for one another. Many factors in proper tattoo placement and design can only be addressed in person as well, since the clients physical attributes, skin type, previously existing tattoos, and other factors play a vital role in these areas. The consultation is also an ideal opportunity to look at the artists work area, and the over-all studio atmosphere, to determine if the shop is sufficiently clean, comfortable, and inviting. Particularly if you are embarking on a large tattoo project, you will prefer to be tattooed in an environment in which you feel safe and comfortable. Lastly, remember this- a consultation is NOT a commitment! You don’t have to schedule an appointment to get tattooed by someone just because you’ve had a consultation! If you are feeling certain you want to work with the tattooer you’ve spoken to, then schedule an appointment. However, if you are feeling any doubt, any hesitation, or any feelings of distrust, lack of confidence, or general uneasiness, DO NOT GET TATTOOED BY THEM. 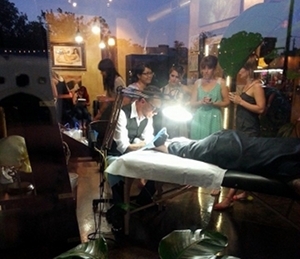 Find another tattooer, and have a consultation with them. Continue this process until you find a tattooer who inspires your confidence, whom you trust, and who makes you feel comfortable and well taken care of.